If life is remembered by firework moments, its satisfaction and true joy are found in the everyday. 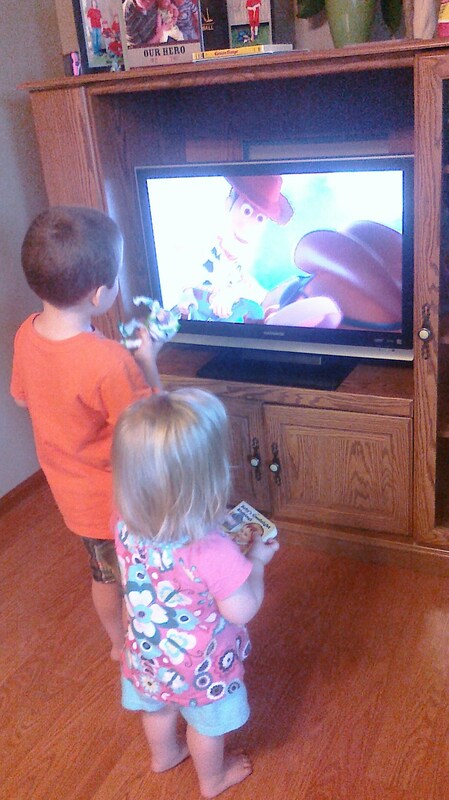 We watched Toy Story 3 together, and both kids were immersed in the movie! Take for instance cuddling with my little girl or dancing around the living room with my son, sharing a bowl of ice cream with the kids, all of us bracing for the sprinkler in the kiddie pool, curling up to watch a movie as a family, listening to my boy pray or realizing that my baby is singing the words to Jesus Loves Me for the first time. Though none of these moments were cataclysmic, all of these events in the life of our family this week made me realize just how blessed I am. Last night we watched Toy Story 3, and at the end of the movie the character Jessie starts a song that brings out Buzz’s Spanish mode and they begin to dance. My son Jackson jumped to his feet as the music began, and turned excitedly in my direction. He dashed toward me and grabbed my hands. Around the living room we twirled. Jackson’s eyes danced as we locked our gaze and laughed, spinning and leaping about. I knew as we danced, these kind of moments would not always present themselves as he continues to grow up, and I savored each step of unconstrained joy. After all, he chose me to dance with him. Life is full of “dance-in-the-living-room” moments. When gathered together they often bring clarity to God’s great design for our lives and propel our perseverance in faith. They are the moments that give us hope when trouble comes. God wants us to have a full, satisfying, amazing life — what John calls the “abundant life“. He blesses each of us with “dance-in-the-living-room” moments to remind us each day of His love. God reveals Himself to us in everyday occurrences because He wants to be a part of every detail of our lives. He wants us to enjoy Him and live life with Him. We can’t have abundant life without Him. When was the last time we truly enjoyed God? When have we let Him grasp our hands and twirl us around the living room? How long has it been since we’ve been unable to contain our love and affection for Jesus? What is holding us back from unabashedly dancing with the Lord? After all, He chose us to dance with Him.